dates for AGC meeting and event information. and water. She starts work at around 8:30 am during the summer months. yard trimming bags, etc. Wear sunscreen and bug spray as necessary. techniques for taking the best garden photos. certified arborist, he will also give us tips on pruning. 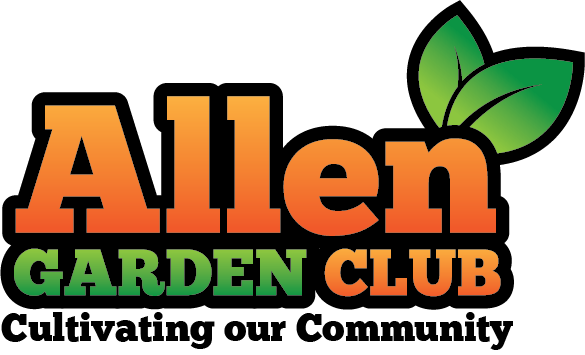 March 19 - Garden clean-up at Allen Heritage Village gardens, 450 St. Mary Dr., 10 am - noon. CONTAINER so gardeners know what they are taking home for their garden. of honeybees and their decline. Blake will also bring some of his honey products for purchase. LABEL EACH CONTAINER so gardeners know what they are taking home for their garden. favorite plants and how you can grow them in your own garden. schedule, please contact us .